To start my walk today, I have to make my way back to where I left off walking yesterday. 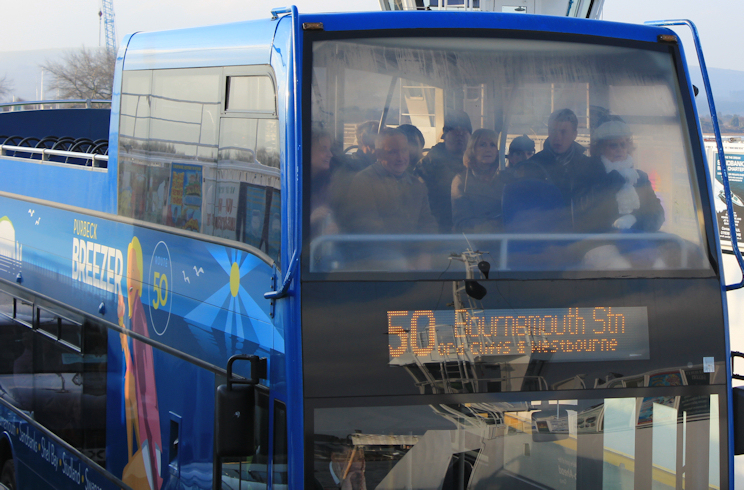 So, I catch the number 50 bus from Swanage bus station. I sit on the top deck, in the front, and have a wonderful view as we wind through Swanage and then across Studland Heath and over the ferry, to Sandbanks. 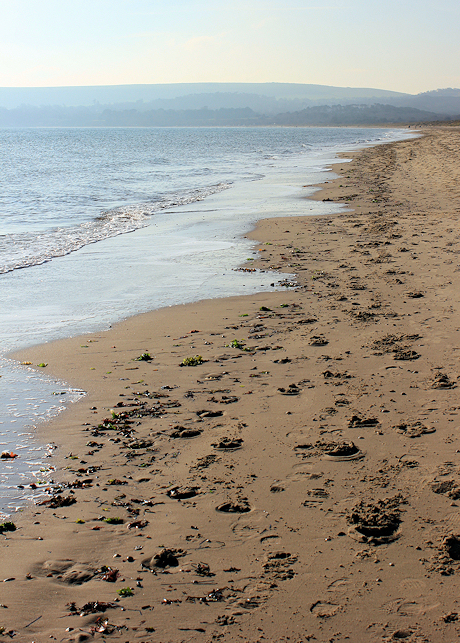 The beach at Sandbanks looks different in the morning light and without the rain of yesterday. There are a group of people on the beach, running about. A man barks orders at them. They drop to the ground and do press ups. It looks most energetic. I wonder if this is what they call a ‘boot camp’? I walk back along the beach, towards the ferry. Unfortunately, the way ahead is barred by a hotel and I have to walk along the access road. Poole Harbour is wide and extensive. But the mouth of Poole Harbour is narrow and there is a ferocious current running through it. I wonder how the ferry manages to cross this hazardous stretch of water without being hurled sideways. As I get nearer to the ferry, I realise it is a ‘chain’ ferry. This explains the loud clanking noise you hear when crossing over. But it also means the ferry is secure and is not going to be swept out to sea, or plunged into the inner water of the harbour, at the whim of the tide. Once across the mouth of the harbour, I finally reach the beginning of the South West Coast Path. This famous long distance path will carry me all around the twisting coastline of Dorset, Devon and Cornwall. I have been looking forward to reaching it. The path follows the shoreline, heading in a southerly direction. The sun is low in January, even in the middle of the day, and I walk – squinting – into the light. The first bay is called Shell Bay. Here are birdwatchers with enormous telescopes, mounted on tripods. They are silhouetted against the bright sea and sky. As I get nearer, I realise the largest telescope has a camera attached. I have a moment of camera envy. Then I remember I am a walker. How could I walk with such a monstrosity? After the small curve of Shell Bay, I come across Studland Bay. This is a beautiful curve of sandy beach, completely undeveloped at the northern end. Inland are dunes and marshland and a lake. And further inland is Studland Heath, managed by the National Trust and crisscrossed with footpaths and cycle ways. I am delighted to be walking in great weather, along this beautiful stretch of sand. 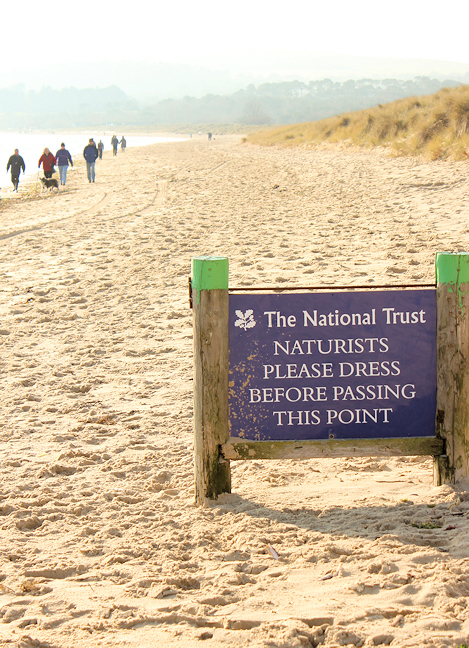 Then I pass this sign and realise I have been walking along a nudist beach. Last time I inadvertently strayed onto a nudist beach with my camera, I was shouted at by a very rude, very naked, and very fat man. But, I have seen no naked bodies today. It is January, after all. I look back the way I have come and I can see Bournemouth in the distance, across the water of Poole Bay. 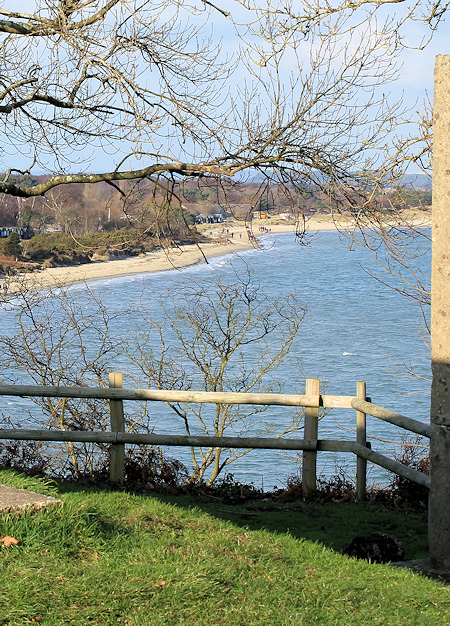 At the end of Studland Bay is the small village of Studland. I reach a place called Middle Beach and climb up to a small cafe for a cup of tea and something to eat. Just beyond here, the sandy beach comes to an end and the land rises up to Ballard Down and the high promontory of Handfast Point. As I climb upwards, I come across a large WW2 bunker, called Fort Henry, built by Canadian Engineers in 1943 and visited by Churchill, Montgomery and Eisenhower in 1944, who came to observe troops training in a practice run for D-Day landings – known as operation Smash. Unfortunately, the training was so realistic, several men drowned when their tank sunk. 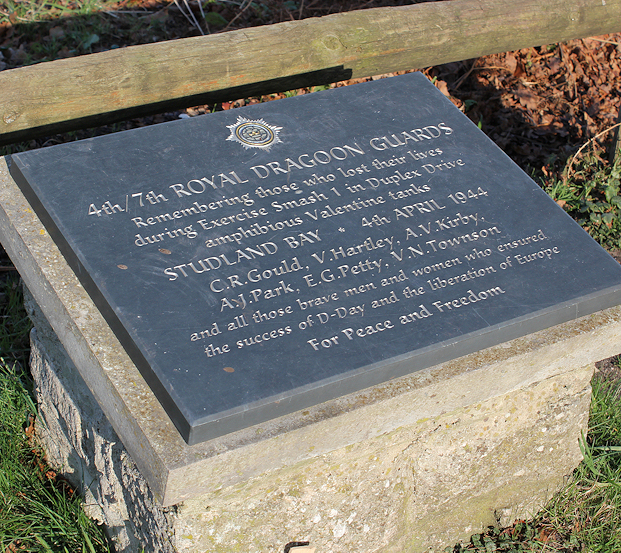 Recently, a memorial to them has been placed here. There is further information about operation SMASH on this BBC page. Once up on the high land, I have an excellent view across to Handfast Point and Old Harry Rocks. This is a popular place for walkers and there are plenty of people about on this sunny Saturday – walkers of all ages, and cyclists. 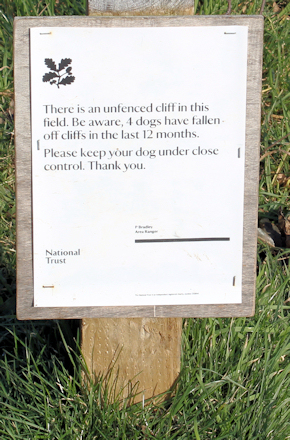 And here is a reminder that we are near precipitous cliffs – a warning sign about falling dogs. I wonder if this is a popular suicide place for human beings. I see no signs advertising the Samaritans and no little memorials of the sort I saw on Beachy Head. Perhaps this place doesn’t attract ‘despondent’ people in the same way. 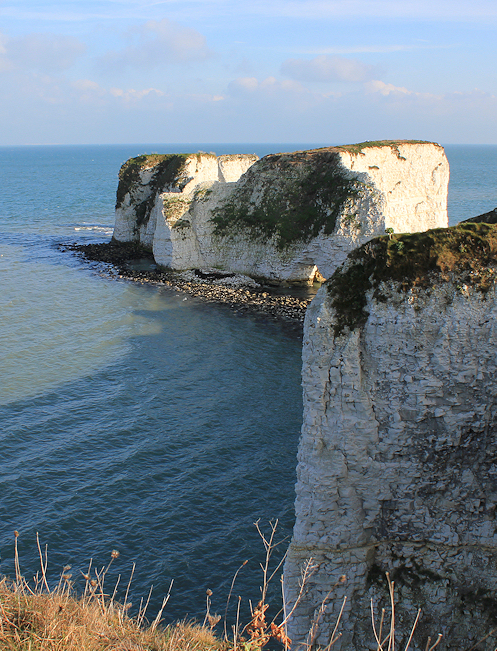 When the sunlight falls on Old Harry’s Rocks, they look splendid against the sea. And, out to sea, I see another white headland. You can see it in the photo. I realise it is The Needles at the far end of the Isle of Wight. Once upon a time, The Needles and Old Harry were probably connected by a bridge of limestone rocks. The land between them has been worn away by the sea and they stand separated but still pointing to each other. I speed up for the rest of my walk. It is early afternoon, but I know the light will fade at 3:30 and it will be dark by 4:30. This part of the walk has spectacular views. Although, I have to admit, Old Harry looks more impressive when photographed from sea level. It is hard to get a good shot of him from up here. The land continues rising, as I follow the edge of the cliff, up towards Ballard Point. Two cyclists hurtle past me, heading down towards Old Harry. I hope their brakes are in good order. From Ballard Point, I take a path and descend, via a winding route and many steps, to sea level again. On the way down, I meet a number of walkers coming from Swanage and also intent on visiting Old Harry. I reach the sand of Swanage Bay and clamber over groynes, making my way towards Swanage. I turn to get some good shots of Ballard Point. There are dark clouds across the sky and I get some dramatic photographs. 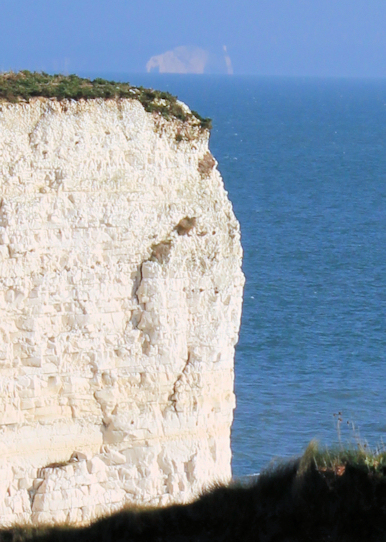 A stylish young couple – who look Japanese – ask me the way up to Old Harry. I point out where the footpath starts and remind them they have less than two hours of daylight left. They seem unperturbed and set off. I am alarmed as they watch them go. It is nearly 3 pm. He is carrying a picnic basket. She is wearing high-heeled boots with platform soles. I worry they will be caught on Ballard Down in the dark. Then, as I watch her stumbling across the sand in her fashionable footwear, I reckon they have no hope in hell of making it to the top of Ballard Point, never mind onward to Old Harry. With the sky darkening, and the sun low in front of me, it is impossible to take any decent photographs of Swanage. This is a shame. It is a lovely place. There are plenty of beach huts, of course. I walk through the town and follow the waterfront until I arrive at the pier. This is on the south side of the bay. Now, viewing Swanage to the north of my position, with the intermittent sunlight from behind lighting up the town’s buildings and the beach, I manage to take some decent shots. Finally, before I head back to my hotel, from the far side of Swanage bay I take one last shot of Old Harry – lit up by the rosy rays of the sinking sun. This entry was posted in 08 Dorset. Bookmark the permalink. Too late for you know I’m afraid, but where you said “the way ahead is barred by a hotel”, I assume this it the Haven Hotel. It is not signed but you can actually walk on the coast side of the hotel. Just continue under the white wall at the base of the hotel and at the end there is a ladder into the car park beside the Sandbanks Ferry. It is a permissive path. I Ruth. Having been wanting to walk the South Coast Path for years and being one of those people who always put these things off, my friend and I finally dipped our toe in the water and set of from Shell Bay yesterday to Swanage and loved every minute of it. Querying how far it was my friend found your blog and confirmed it was 8 miles. We re-lived our steps from your interesting commentary and we are now inspired to follow your footsteps for each leg as documents by you. Thank you for taking the trouble to do this for us all to enjoy. Hi Anita, and you’re in for a real treat. The South West Coast Path is wonderful! My next walk was a circular one, as I had trouble working out transport links. Came back with my hubby as chauffeur and that made it much easier to make progress. I’m sure you’ll work out a way of doing it. It’s a fabulous part of the coast. Yours, Ruth. 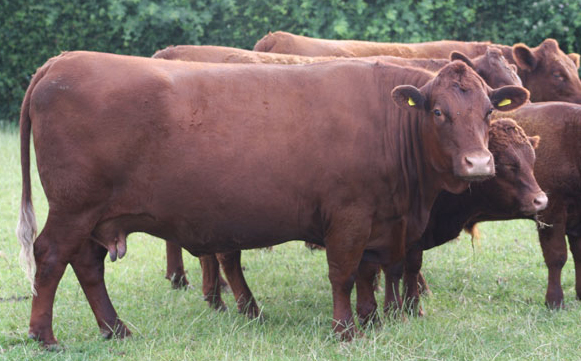 Hello Ruth… I have been following your walks for a while…. After recently retiring from the NHS I have commenced my ” bucket list” and started at The South West Coastal Path , South Haven Point and hope to walk The British Coastal Paths, following in your foot steps…. Excellent first days walking. More fabulous photos. I wonder if you spotted any ring-necked parakeets at Studland, they’ve had colonies there for a few years.